Senator Bong Revilla’s privilege speech prompts calls for a legislative inquiry. 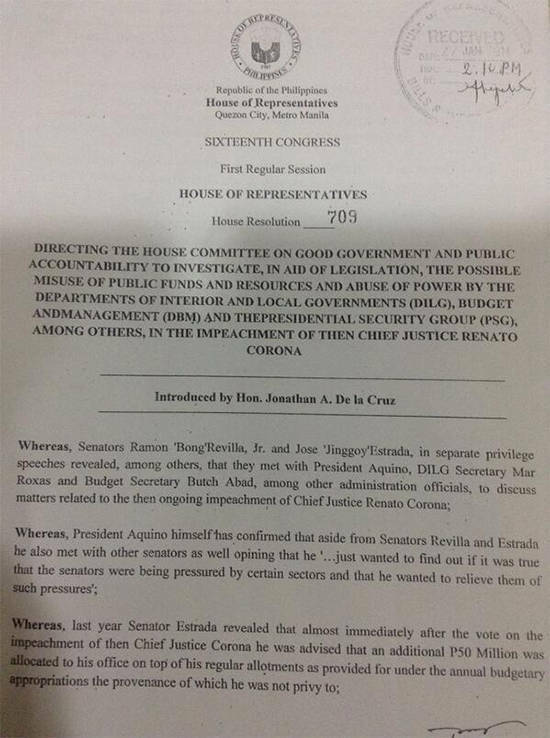 (SPOT.ph) In response to Senator Bong Revilla’s deep-sea excavation of suspicious government deals from the past, ABAKADA Rep. Jonathan Dela Cruz today filed House Bill No. 709. The bill seeks a probe into the Department of Interior and Local Government (DILG), Department of Budget and Management (DBM), and The Presidential Security Group (PSG)-agencies that Senator Revilla accused of conniving to influence the Senate’s verdict on former Supreme Court Justice Renato Corona. Rep. Dela Cruz wants to find out if there was misuse of public funds and abuse of power, which is now casting a bad light on one of the most celebrated trials under P-Noy’s administration. 2. In a separate privilege speech, Senator Estrada admitted that the senators received P50 million each as an incentive for their "good work" during the Corona impeachment trial. Did Senator Revilla get his "reward" and did he use it for good? Or for me-vil? 3. Is this going to be one of those probes that are launched into outer space, then left to wander aimlessly in the cold, dark universe, hence wasting even more public funds? 4. Why are they (Estrada, Revilla) only talking now? 5. Will Senator Revilla star in a movie that focuses on these issues, similar to 10,000 Hours?